As told in the previous article, if the Open File dialog has Vista style, it’s not possible to use common dialog box messages like CDM_GETFOLDERPATH and CDM_GETSPEC in order to calculate the necessary buffer size, for multiple selection. Instead, we can use Common Item Dialog API, in our case IFileOpenDialog interface. for each item call IShellItem::GetDisplayName; use the name length in order to calculate the necessary buffer size. Further, we can use the returned value to set the OPENFILENAME buffer, if necessary, in CFileDialog::OnFileNameChange overridden function (see the previous article). Anyway, more implementation details can be found in the attached demo application. 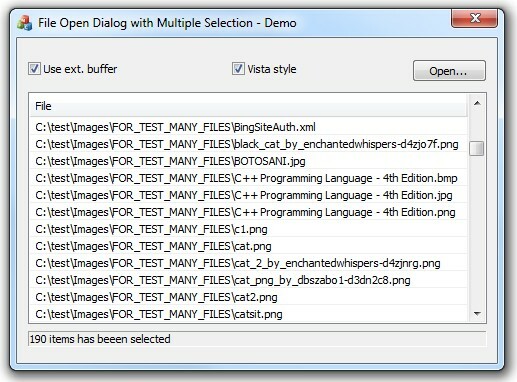 The demo application contains the complete implementation of a CFileDialog-derived class, that fixes the multiple selection issues described in this article. It can be used either for Vista or old style file dialogs. Also, to see what happens if use the default buffer, just uncheck “Use ext. buffer” then push “Open…” and finally, select a large number of items from the open file dialog list. This entry was posted in MFC and tagged CFileDialog, mfc on 2013.05.20 by Ovidiu Cucu.